It’s the most wonderful time of the year, and that means more wonderful marketing campaigns hitting our screens from brands hoping to make the most of the festive season. With Brits expected to spend around £446,000 every minute this December on presents alone, it’s no surprise that retailers are stepping up their advertising game for the holidays. From a child dressed as an electrical appliance to pornographic elves, check out our pick of the best Christmas marketing campaigns below. Sainsbury’s The Big Night campaign is a great example of how veering away from heavily promotional advertising can work in an established brand’s favour. 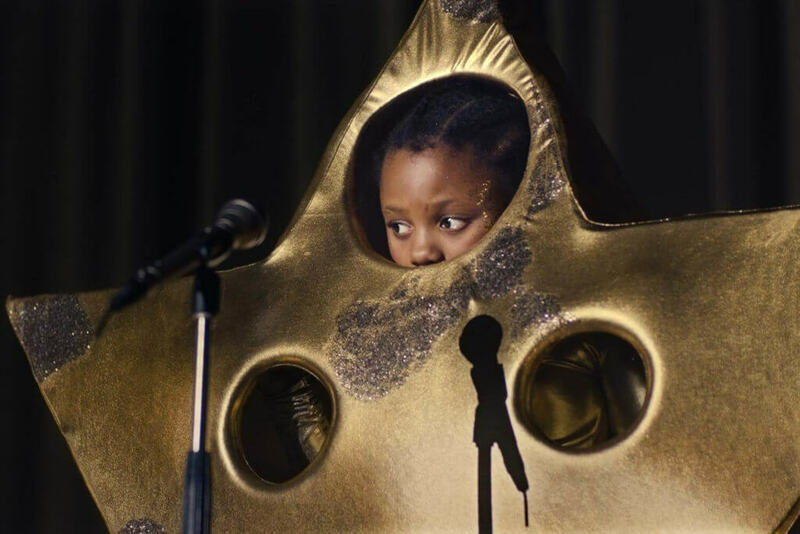 Launched on December 12th, the theatrical depiction of a school production shows a young girl dressed as the North Star nervously stepping on stage to sing before blowing the audience away, including her emotional mum. Despite the ad’s heartwarming message, it was met with some criticism from parents who were concerned about one of the play’s characters, ‘Plug Boy’. To light up the Christmas tree, a young boy dressed as a plug runs across the stage and launches himself into a socket. The Advertising Standards Agency received numerous complaints labelling the stunt unsafe and claiming the brand are encouraging irresponsible behaviour. We all know that Coca-Cola is the undisputed king of Christmas and it’s not the start of the festive season until the iconic twinkling truck advert graces our screens, but this year the focus is on the brand’s experimental White Christmas campaign. 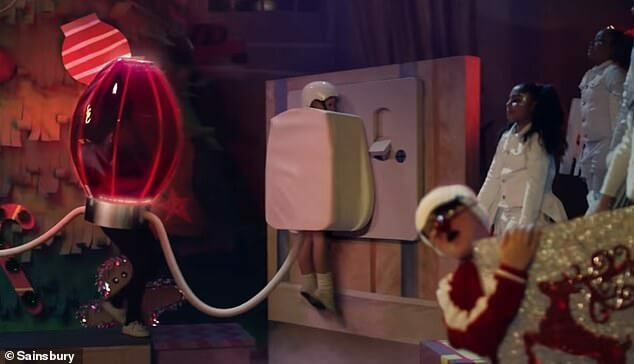 Using high-tech vending machines and a little holiday magic, the fizzy drink giant sought to emphasise the giving spirit of Christmas while cementing its position at the top of the festive campaign chain. 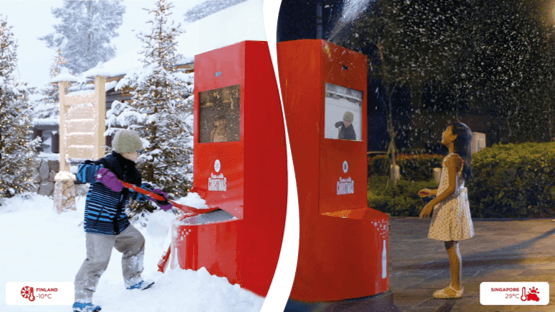 Based on their ‘sharing happiness’ slogan, the brand placed two Coca-Cola vending machines in two drastically different climates, encouraging locals to forge lasting friendships via a livestream and ‘#shareawhitechristmas’. With one machine placed outside the Santa Christmas Village in Singapore and the other in Lapland, the short film released on December 19th shows Laplandians shovelling snow into the open compartment to send a shower of snowflakes down on their new friends on the other side of the world. Commenting on the campaign, Pratik Thakar, head of content and design excellence at the Coca-Cola Company, said: “This spectacular video brings to life one of the most exciting parts of the festive season, even in the warm climate of Singapore. It’s not just about snow from Finland being brought to Singapore, but also about strangers from around the world engaging in the true spirit of giving. This is what Coca-Cola is all about – sharing happiness.” Nobody does Christmas quite like Coke. Taking a more Guerilla approach to Christmas marketing, Lidl’s festive billboard campaign shows how inventive advertising strategies pay off. Consisting of a series of posters showing a similar creative to Waitrose and Marks & Spencers overlaid with a Lidl ad promoting cheaper prices, this campaign seeks to remind consumers that the German brand are ‘Big on Quality, Lidl on Price’. To add insult to injury, the new posters are situated within 100 metres of the opposition. Ryan McDonnell, commercial director at Lidl UK, said: “Our deluxe range offers customers the best value and quality in the market and these ads are all about us getting that message out there. Shopping anywhere else means customers are paying more than they need to for great Christmas products. 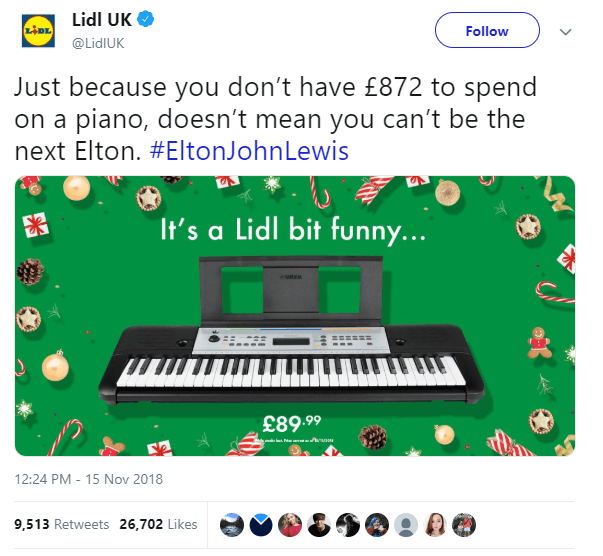 “Our premium range means customers can really upgrade their Christmas this year, without a hefty shopping bill.” The brand also joined in with the other retailers that were quick to parody, undermine or hijack John Lewis’ 2018 Christmas effort, taking to Twitter to capitalise on the underwhelmed social media response and simultaneously promote its well-priced products. Controversy sells, even at Christmas, as Poundland’s Elf on the Shelf campaign shows. Back for a second year by popular demand, the naughty Elf and his new girlfriend Elvie have taken to twitter to deliver some festive filth, posing in suggestive positions while promoting products offered by the budget brand. 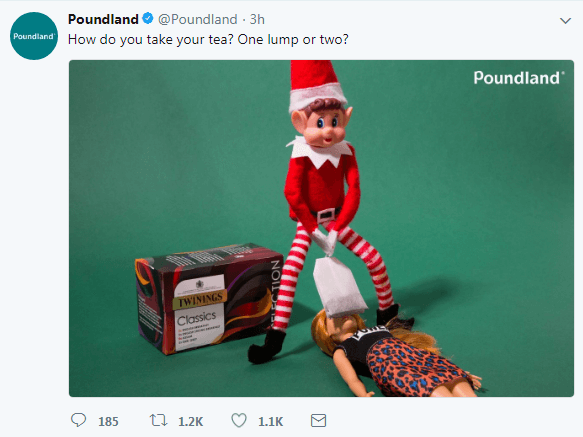 Despite the Advertising Standards Authority banning the ads last year after receiving countless complaints, Poundland have brought Santa’s favourite little helpers back, bigger and more controversial than ever. 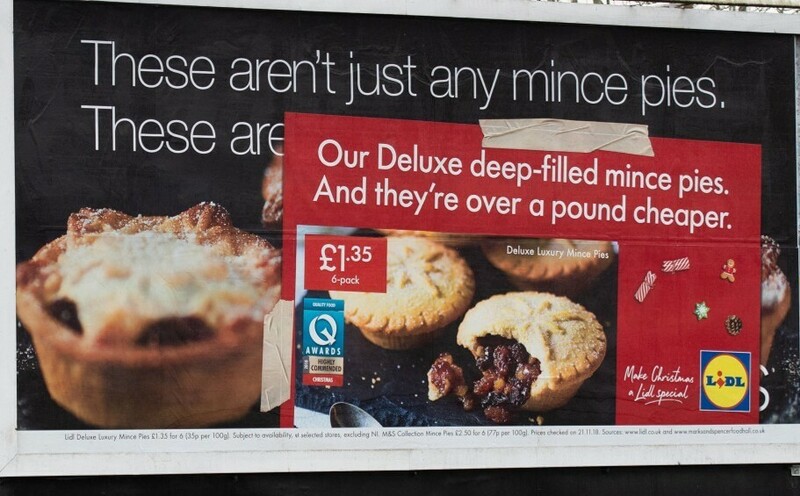 Cleverly emphasising its cheap prices, the brand claimed the reason for the elves’ return is that they already bought them for last year’s ads and would rather save money this Christmas. If you’d like to make the most of the festive season and create a PPC or SEO strategy that keeps on giving, get in touch with us today.